← Finally Made It To Pose Fair! There is a vast network of communities in Second Life and I can’t keep up with all of them, but while engaged in some tweets today I noticed one that said, the Dalai Lama is in Second Life. I was certainly curious but figured it would be all over by the time I got inworld. Then I saw the event was still underway, so what the heck, I jumped in to take a look. Wow, the Dalai Lama’s avi even looked like him and his gestures and anims were very Lama-like. It’s really amazing, isn’t it. 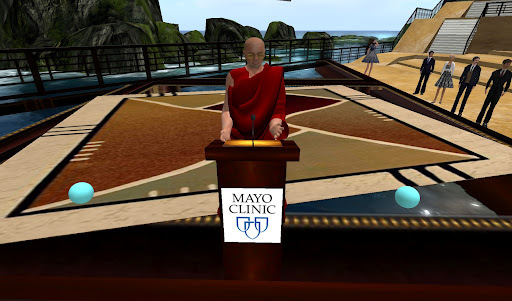 The event was being held at the Mayo Clinic sims and here’s the announcement. There he was, the Dalai Lama, speaking in SL! at the Mayo Clinic auditorium. And of course, there was an attention seeking griefer. I only caught the last 20 minutes or so. His speaking came through SL voice which was cool. I enjoy his answers to questions from people seeking direction in their lives. He treated each question with thoughtfulness, not relying on some jargon. I like this man. This entry was posted in Events and tagged Avatar, Events, Identity, Real Life, Second Life, Socialite. Bookmark the permalink. What could be more appropriate than an incarnation of the Dalai Lama in a forum called "Second Life"? wow, Lee… I didn't think of that! Wonderful observation! So was it really him? That's really interesting. Hi Berry, yes it was really him. They had a live feed on the website of him speaking in front of an audience also, a sort of simulcast I suppose. I was so surprised that _the_ Dalai Lama was in Second Life, I just had to go to at least pay tribute. I think its great that the dali lama uses technology to reach people this way. Bravo sir! I would have LOVED to go see this! Too bad I didn't see any advertising on it before it happened. I think the Dalai Lama leads an incredibly unique and interesting life (or two now!). I wonder…where will we see his AVATAR next? I'm so gutted I missed this 😦 What an opportunity! Did you hear if he'll be speaking again? Hi everyone…Yes, it was really the Dalai Lama (but he wasn't operating the avatar). It was really a unique experience, a type of simul cast.Several acquaintences in education were talking about it on Twitter, and I almost backed off. I'm glad I went and was able to share this with everyone.As Lee points out, what could be more appropriate than the Dalai Lama in Second Life. The mind swims in the thoughts that flow from this. Well, I was actually sceptical that it was really him. I'm pleasantly surprised.The Dalai Lama is an amazing man.Thanks for the post. With the simulcast you could watch him live at Mayo Clinic and inworld, and feeds were identical. And I agree, the Dalai Lama is an amazing man.